The City of Judas is an imaginary Jerusalem in the middle age of the crusades: players take the role of members of the Brotherhood of the Iron Fist, a shady company of mercenaries located in Jerusalem. City of Judas presents a world of darkness and demons threatening the holy land, and players will have to take side in the clash between the church of Christ and the cult of Judas, and protect the holy city. 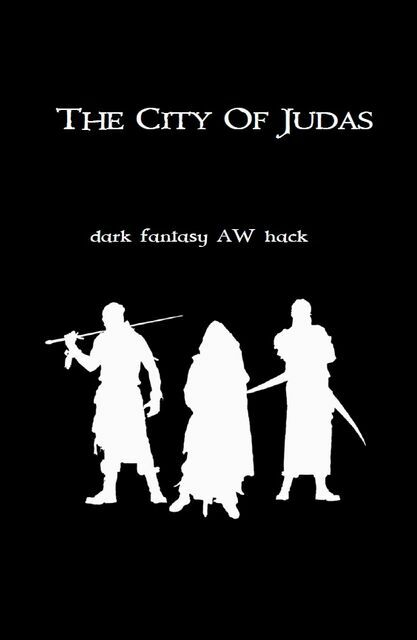 City of Judas is an Apocalypse World (AW) fantasy hack, for 3 to 6 players. The manual contains a set of new moves, additional mechanics such as the Advantage Die, original combat mechanics, ten playbooks of Iron Fist mercenaries for your players.The GM section includes GM Principles and GM Moves, guide to the first session and character creation, elements for missions and fronts, and a complete set of wild monsters and demons.